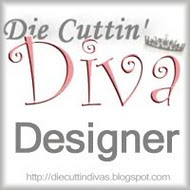 Welcome to Die Cuttin' Divas Challenge #98. This week's challenge is to use a penguin in your project. I chose the penguin from the Jolly Holidays cartridge--isn't it just so cute? Since he (or she) was holding the umbrella, I just had to go with the phrase, "Under the weather?" I don't have any sick cards in my stash, so this was a good way to add some, especially since I decided to make two cards. Inside sentiment is a wooden stamp. Our sponsor for this week's and next week's challenge is Robin's Nest, and they are generously providing a $50 gift certificate!! You have one week to plan, create, and submit your project. Remember to include which die cut you used and a link back to Die Cuttin' Divas. You may enter up to 3 projects per challenge. The prizes are for 2 weeks of challenges with the winner being announced every other week from two combined challenges. Here's the second card I made. This penguin was my first cut, which I thought was a bit small, but figured, why not make a second card. I'm also trying to use up some of the MANY scraps I have. We look forward to seeing your projects this week! Thanks so much for stopping by. Awww...What a FUN Challenge,in which I will be playing.Your penguin is simply ADORABLE!The embossed could is very cute.Both sentiments are so SWEET!LOVE this card,Pat! !LOVE Penguins!! Such a CUTE card!! LOVE the adorable penguin!!! These cards are super cute!! Love it!! Cute penguin and sun embossed umbrella...very fun. This is such a cute card Pat. This will def cheer someone up.